Hundreds of protesters, many of them college students, gathered around the statue called Silent Sam tonight at 7:00 PM on the University of North Carolina Chapel Hill to voice their concerns about the presence of the Confederate monument. 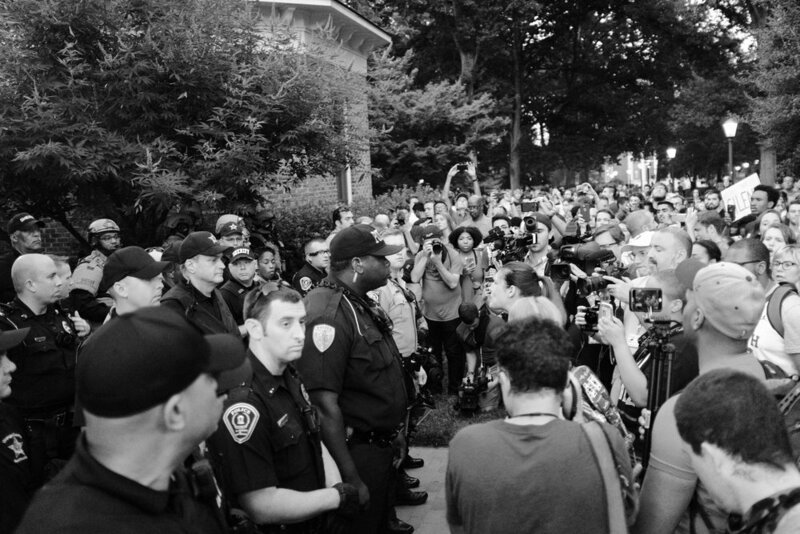 Buoyed by the recent national exposure white supremacy has been receiving in the media, and emboldened by the actions of activists in neighboring Durham, the action was expected to draw large crowds and possibly some opposition. In response, Governor Roy Cooper informed UNC leaders that the 2015 law forbidding removal of monuments such as these contained a provision that would allow for their removal in the case of public safety concerns. UNC declined to remove the statue. Instead, Chapel Hill police and the Orange County Sheriff's Department encircled the statue with two steel barricades. Large groups of police stood guard inside the barricades and patrolled the perimeter, wearing gas masks and loops of cable ties. Sheriff Blackwood stood with a command group overlooking McCorkle Place, pointing out specific persons of interest in the crowd for a deputy to photograph. At one point, half a dozen nervous officers converged on a man vaping in a corner, questioning him because of the presence of "smoke". The police were omnipresent, heavily armed, and expecting a riot. It's no real surprise, then, that they attempted to start one. Just before 8:00, police officers decided to arrest a man wearing a bandana around his mouth, choosing to enforce a misdemeanor masking law that, ironically, was created to help combat the violent activities of the Ku Klux Klan. They took the man into custody and were immediately beset by the entire group of protesters, shouting "Let him go!". Law enforcement was overwhelmed. They were backed into a corner -- both figuratively and literally -- by the full weight of the hundreds of citizens who came to peacefully protest a symbol of hatred on their campus. 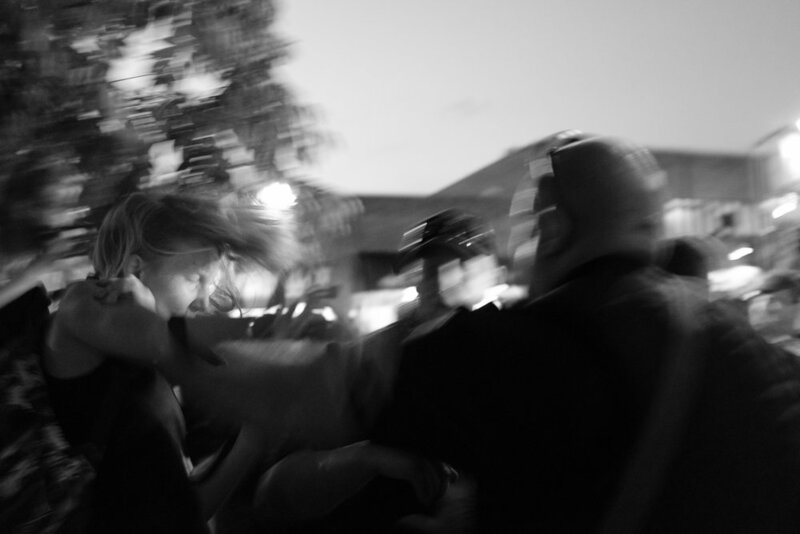 When protesters attempted to stop the prisoner transport van from leaving -- primarily by sitting passively on the ground in its path -- the police used the only tool they have: violence. They pushed and shoved, threatened and cajoled. Questionable assertions of the protesters' rights were made. At least two people were thrown forcefully to the ground. Eventually, the protesters were moved far enough that the van could transport its prisoner to the jail, where he was released a couple of hours later with a couple of minor charges. The police were prepared for a riot. There were deputies in combat armor with assault rifles present. It was an overwhelming show of force, and it was criminally negligent for them to put the public, and themselves, at risk over a man wearing a mask, or a statue that could have been removed, or the defense of an officer who made a really stupid call about how to act in a potentially explosive situation. 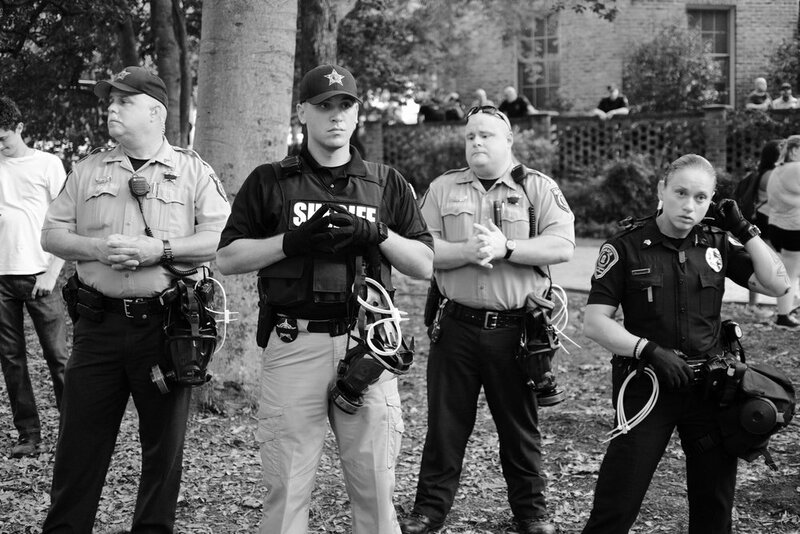 The Chapel Hill Police and Orange County Sheriff's Department cannot serve and protect their community by surrounding and threatening them with more violence, and they cannot expect the trust of their community if the best they have to show is dangerous incompetence. Here is a fantastic video of the events filmed by the wonderful Michael Galinsky. On August 22, 2017, hundreds of people gathered at the Silent Sam statue at UNC-Chapel Hill to demand removal of the Confederate monument.